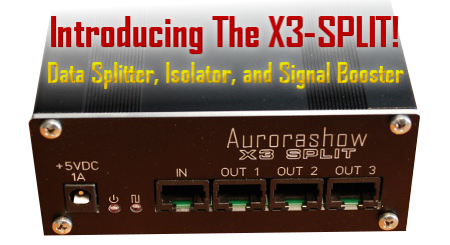 We are excited to announce the arrival of the new Aurorashow X3-SPLIT, a lighting data splitter, isolator, and booster. The X3-SPLIT is your all around data wiring problem solver. Compatible with DMX, D-Light, and LOR protocols, the X3-SPLIT splits your data line three ways making your display wiring easier. Each of the three branches are boosted to full signal strength to improve the performance of your longer cable runs. In addition, each output is optically isolated and power source isolated to protect your upstream PC / devices and to solve any ground loop issues. I have having an issue with my X3 split I purchased. My understanding is that it would work on the D-Light protocol if configured properly. I can only connect to the controllers before the X3 split and not passed the X3. I am still running D-light protocol though Aurora Show. Please contact me ASAP I was going to launch my show tonight, but if this dosent' work im going to have to run several more cables than hoped for. A reply to your support email should be in your inbox. Please note that in D-Light applications the X3-SPLIT is unidirectional. It only passes lighting commands to controllers that have already been configured via HWUtility and/or the firmware updater. Any controllers past the X3-SPLIT will not be reachable by HWUtility for discovery, configuration changes, etc. Firmware updates and configuration will need to be done out of the show chain and attached directly to your RS-485 adapter (this is recommended anyway even without the X3-SPLIT). This only affects the one time firmware/configuration setup steps. Controllers that have already been configured will properly respond to all lighting commands from your show software (e.g. Aurora) when used with the X3-SPLIT. Is the front panel data LED lit? Are the LEDs on your D-Light controllers solid or flashing?